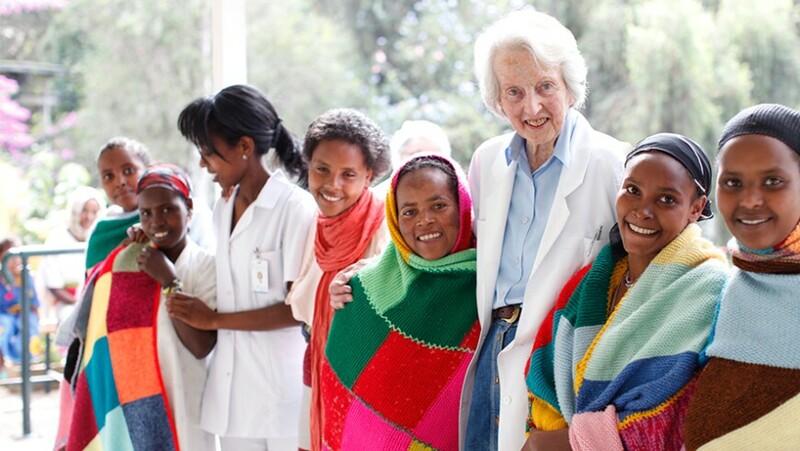 More than 50 years ago, Dr. Catherine Hamlin and her late husband began their work in Ethiopia, which led to the founding of the Addis Ababa Fistula Hospital, the only health care facility in Ethiopia dedicated to treating and rehabilitating victims of fistula. Dr. Hamlin and her team treat about 2,500 women a year and support outreach efforts to educate women about the importance of prenatal and obstetrics care. Fistula is a debilitating injury of childbirth that results from long, obstructed labor. Without access to emergency intervention, the physical trauma of laboring for days leaves women with a hole in the birth canal, causing them to leak urine or feces uncontrollably. Untreated, the fistula leaves women permanently disabled and often socially isolated. It is estimated that at least 2 million women worldwide live with fistula, and about 100,000 new cases are added annually, mostly in rural and resource-poor countries. This tragedy is both preventable and treatable. With widespread access to health care and emergency Caesarean section surgery, fistula has virtually been eliminated in industrialized countries like the United States. The best way to prevent fistula is to ensure that expectant mothers have access to quality health care services before and during childbirth. In a first-of-its-kind partnership, Johnson & Johnson has joined forces with The United Nations Health Four+ (H4+) to train skilled birth attendants in emergency obstetric and newborn care and to develop the health care workforce in Ethiopia and Tanzania. Another partnership with the Royal College of Obstetricians and Gynecologists and Liverpool School of Tropical Medicine supports a three-day program in Nigeria that trains over 200 midwives, nurses and physicians each year to enable them to identify and manage emergency birth complications. We also partner with organizations such as United Nations Population Fund (UNFPA), Fistula Foundation, Comprehensive Community Based Rehabilitation in Tanzania (CCBRT), Direct Relief International, One by One in Kenya, the International Society of Fistula Surgeons (ISOFS), Women and Health Alliance International (WAHA) and Addis Ababa Fistula Hospital to help women access obstetric fistula surgery services and to train more surgeons. These partnerships help underserved women living with fistula in countries including Cote d’Ivoire, Liberia, Tanzania, Democratic Republic of Congo, Kenya, Eritrea, Nigeria, Angola and Ethiopia. Fistula treatment goes far beyond repairing the injury. Many patients—especially those who have lived with the condition for years—require emotional, economic and social support to fully recover from their ordeal. We partner with programs such as the UNFPA-led Campaign to End Fistula, CCBRT and Women and Health Alliance International (WAHA) to provide women counseling as well as life and job skills training to help them get back on their feet after surgery. Working with communities is also pivotal to reduce stigma surrounding the condition and ensure women are welcomed back into society.